Let me start this out by saying that the following information is by no means the only way to make pie crust. 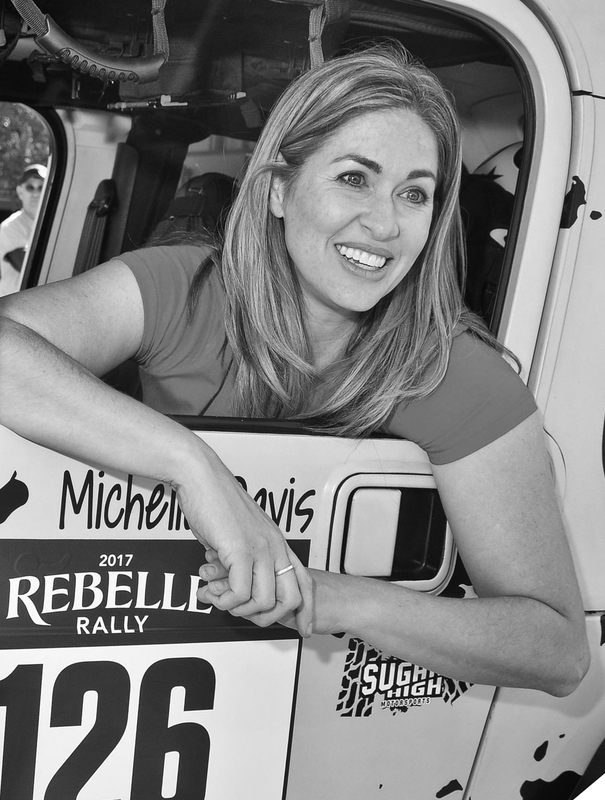 There are a lot of different recipes and different methods out there that will produce fantastic results, this just happens to be the way I do things. Pie is one of my favorite desserts and the crowning jewel of any pie has got to be the crust. No matter how fabulous the filling is inside, if the crust is burnt, cracked or completely distorted; it visually takes away from the appeal of the pie. Like the saying goes, “We eat with our eyes first.” So if a pie, or any other food for that matter, doesn’t look good, we are less likely to try it and may even be less likely to enjoy it. It is for this reason that I have spent years trying to get homemade pie crust perfected. 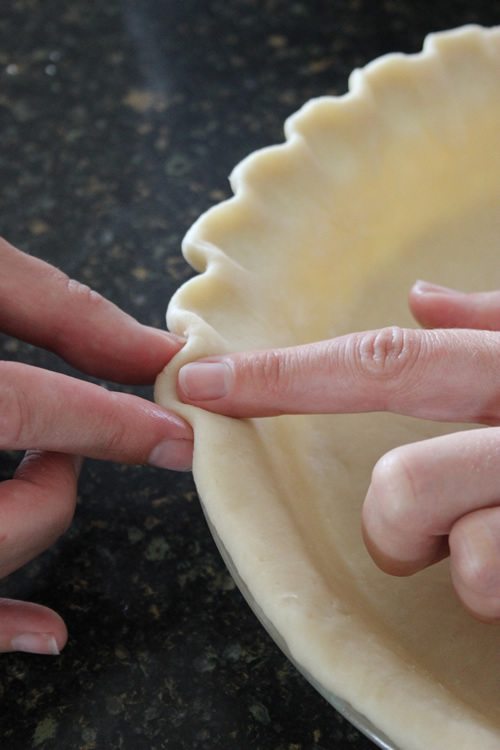 Pie crust can be very challenging. I am still far from perfection and still have a lot to learn but I have figured out quite a few things along the way that have helped my technique so I thought I would share them with you. The above picture is of three pies I made specifically for this instructional tutorial. 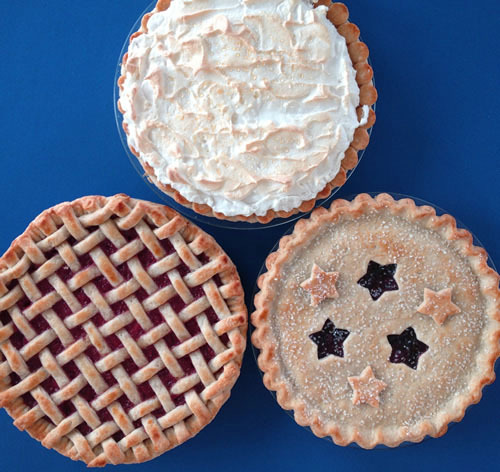 One is a single crust pie, one a double crust and one a lattice top. Since there is a lot of information to cover I am going to break this up into three different tutorials. Today I will go over the recipe and techniques for a single crust pie then next week I will show you how to add a top crust for a double crust pie and also how to form a lattice top pie. I hope this information might be helpful for you whether you are new to pie crust making or just trying to improve your techniques. As I said before, there are lots of different recipes for pie crusts. I know some people who uses eggs, some who use vinegar, some who use shortening, some who use all butter, etc., etc., etc….. I use a pretty basic recipe that just includes flour, water, salt, sugar and fat. I have found that when it comes to fat, butter produces the best flavor but tends to create a crust that is a little tougher and lard produces the flakiest crust but tends to be a little lacking in flavor. My solution is to use half butter and half lard. These are the amounts for a double crust pie. If you only need a single crust pie you can halve this, or do like I do and make the full batch then refrigerate the leftover crust and use it later in the week for hand pies or chicken pot pie or something like that. 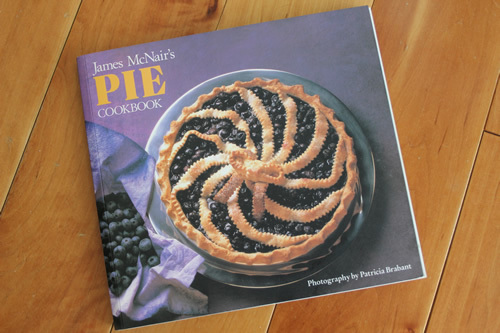 I got this recipe, as well as many of the following techniques from my favorite pie book, James McNair’s Pie Cookbook . I LOVE this book. Every recipe I have tried in it is wonderful and it has great pictures and very thorough explanations of ingredients and techniques. I highly recommend this book to anyone who loves pie making. One of the most helpful things I learned from this book was to use a food processor to blend the ingredients. I used to always do it by hand but never could get the ingredients mixed thoroughly without over handling the dough. The food processor made a world of difference. The important thing to remember when working with pie crust is that your ingredients stay cold. Your water needs to be very cold so the first thing you want to do is fill a large glass with ice and water so the water has sufficient time to cool while you are preparing the rest of the ingredients. The one problem with a food processor is that it can quickly heat up your fat. 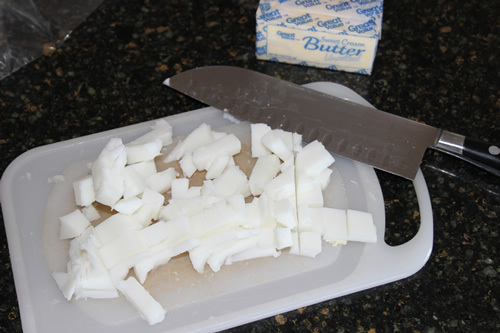 To combat this problem, you want to make sure that both your butter and your lard are frozen. You also want them cut into small pieces so that they blend together easier. 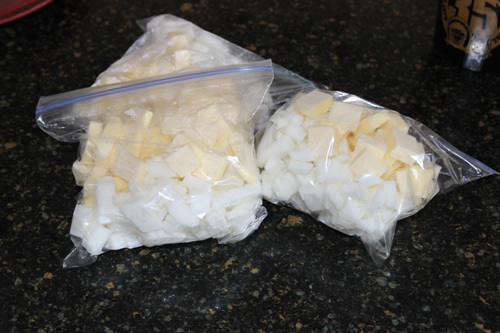 It is a pain to chop up frozen fat so I like to make bags of fat ahead of time and keep them in the freezer so that they are already measured out and ready for me when I want to make a pie crust. Then I store them in a sealable baggie that I keep in the freezer. One box of lard and one box of butter make four pie crust recipes so I usually make four baggies worth at a time. I’m not sure how long they stay good in the freezer since I always use them up before they go bad but I assume they will last for quite a long time. Place the steel blade in the food processor then add the flour, salt and sugar in the bowl. Turn it on and process for a few seconds to combine. Add the frozen fat to the bowl and turn the processor on and off in quick pulses just until the mixture looks like coarse bread crumbs. Now add the ice water. 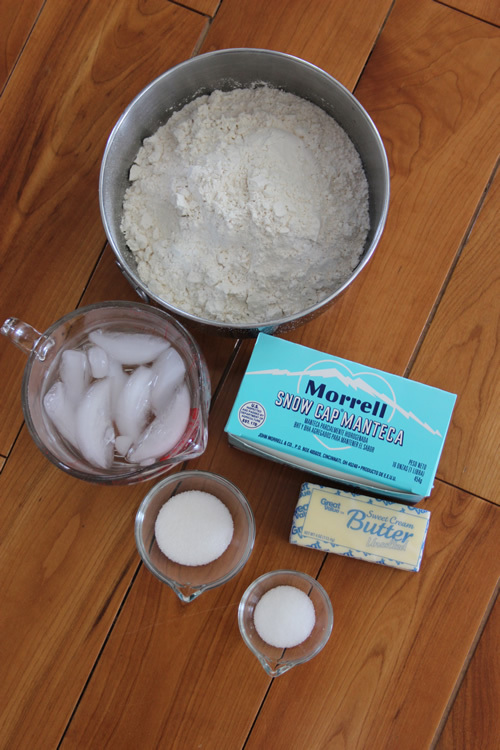 Start with 1/2 cup and sprinkle it over the mixture (be sure to remove the ice from the water before adding). Pulse the processor again just until the mixture begins to clump together. Do not overmix or it will cause the fat to melt and the dough to smear together instead of clump together, which will then result in a tough crust. 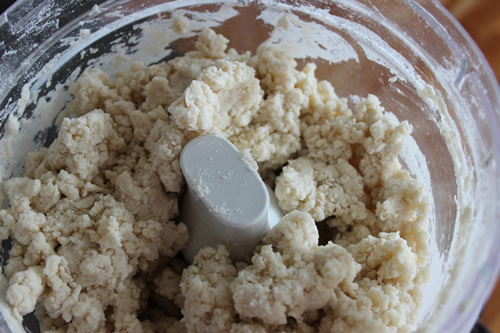 If your mixture is too dry and crumbly, add more water but no more than a tablespoon at a time. I live in a very dry climate so I usually have to add about 2-4 tablespoons of water, depending on the brand of flour I use and the humidity in the air that day. The dough should be thoroughly hydrated but not wet to the touch. Figuring out the correct moisture level of the dough was probably one of the most difficult parts of crust making for me. I still mess it up sometimes. I’ve found that ideally it should be slightly drier than what I usually think because as it rests, in the next step, it continues to hydrate. But you also don’t want it to be too dry and crumbly because then it tastes like flour and is a nightmare to try to roll out. 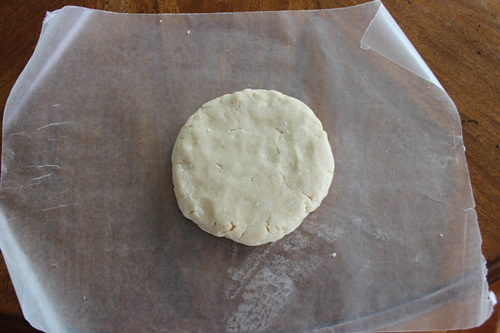 The photo above is an ideal moisture level in the dough. Now you need to divide the dough in half. I pour all the dough out of the processor bowl into a mixing bowl and weigh it on my food scale so that I can divide it in half perfectly. You want to form each half into a disk about 5 inches wide. 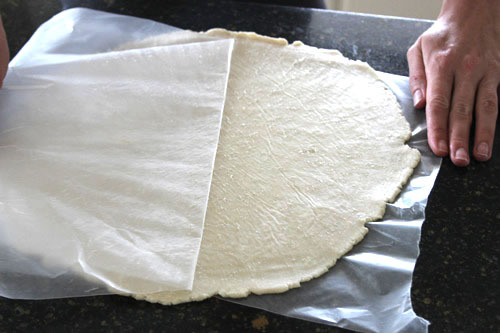 Wrap each disk individually in waxed paper and place in the refrigerator for about 15 minutes to allow the dough to rest. This will help develop a more tender crust. When it comes to rolling out the dough, I like to use waxed paper. 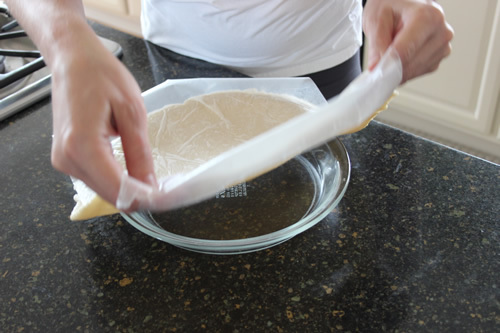 This prevents you from having to add extra flour into the dough and also keeps your counter and your rolling pin clean. 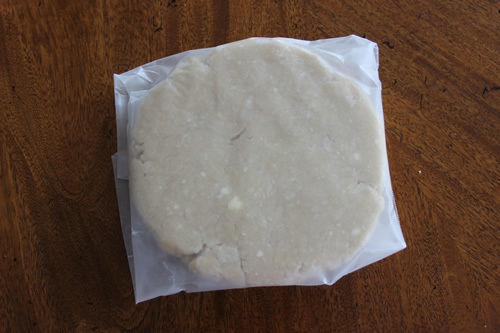 Once the rest period is over place a clean sheet of waxed paper on your counter, take one of the disks out of the refrigerator, place it on the clean waxed paper then cover it with another piece of clean waxed paper. Allow it to set for 5 minutes to soften slightly. Starting at the center of the disk, roll the dough between the two pieces of waxed paper, turning your disk about a quarter of a turn as you work your way around. You’ll notice in the picture that I hold the waxed paper in place on the counter by pressing the corners of the paper between the counter’s edge and my belly. 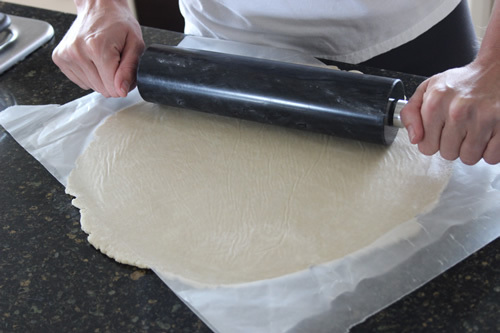 Continue to roll the dough until it is about 1/8th inch thick and large enough to fill your pie plate and hang over the edge by about 1/2 inch. For my pie plates I need about a 12 1/2 inch circle, which means I need my circle to roll out slightly larger than the sheet of waxed paper. 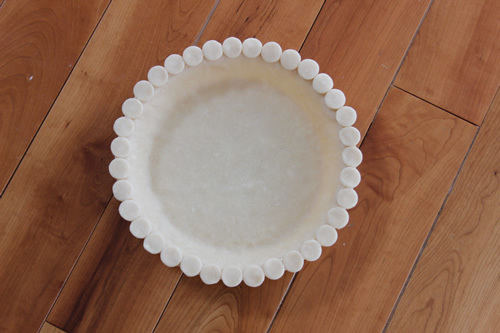 Just a note on pie plates: You can buy pie plates made of glass, ceramic or metal. I have plates made of each of these materials but my favorites are my glass plates. I just like the way the crust cooks evenly in them and you don’t have to worry about scratching them up when you cut into them. I use my others as well but I definitely use the glass ones the most. 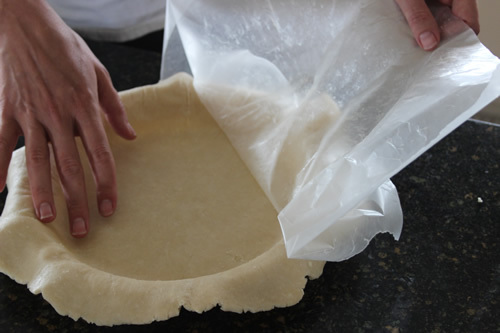 Before you place your crust into the pie plate you want to make sure it won’t stick to the waxed paper. 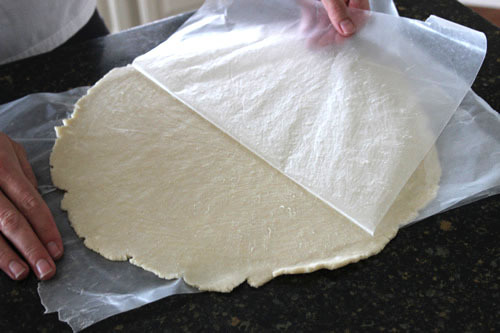 Carefully lift half of the top paper off the dough, stopping once the waxed paper loosens at the middle of the dough. Now lay that half of waxed paper back down and remove the other side the same way until the whole piece lifts off the dough. 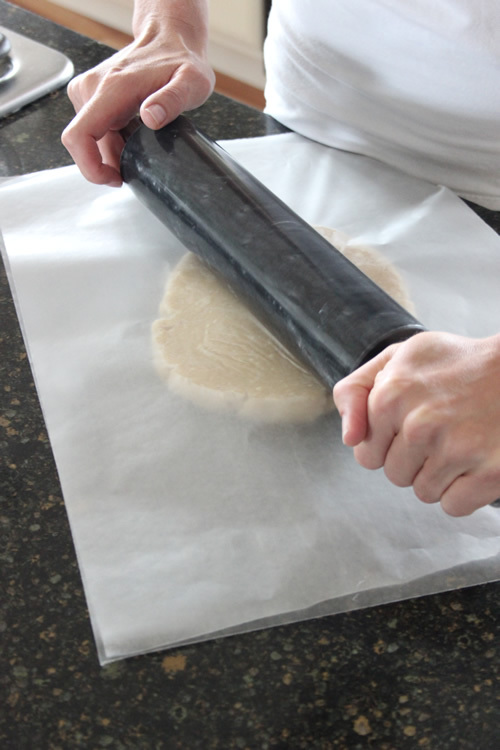 The reason you do it in halves is that you are much less likely to accidentally tear your dough if the waxed paper sticks. 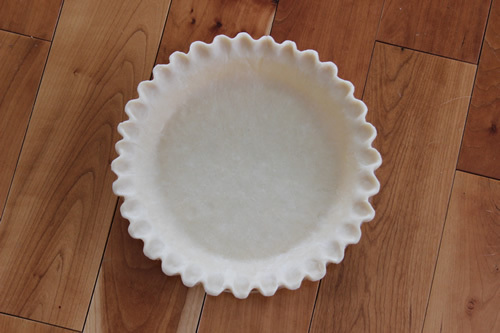 To line the pie plate, lift the dough (the bottom of it will still be stuck to a piece of waxed paper) and lay it in the pie plate with the uncovered side being placed into the plate. Make sure you center it so that the sides evenly hang off all around the plate. 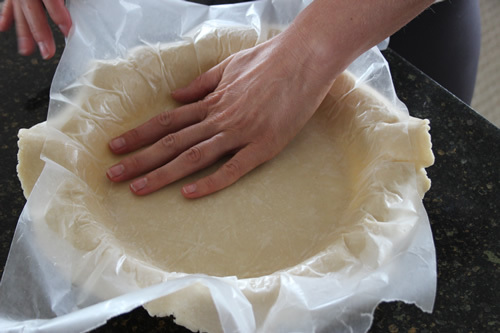 Use your hands to gently lift and press the dough against the edges of the plate, trying not to leave air gaps. Once it is in place, carefully remove the waxed paper, one half at a time, the same way you did before. 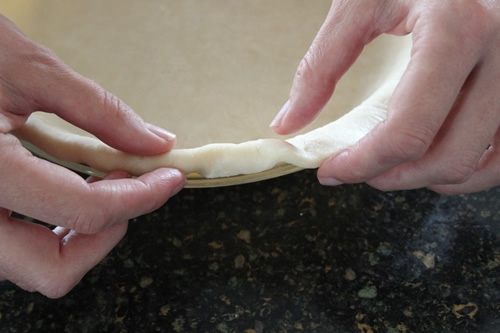 Roll the dough under with your fingers so that the edge comes underneath itself onto the rim of the plate. Now it is time to shape the edge. There are lots of different ways to do this but I’m just going to show a couple of examples. The most common shape is probably the scallop. 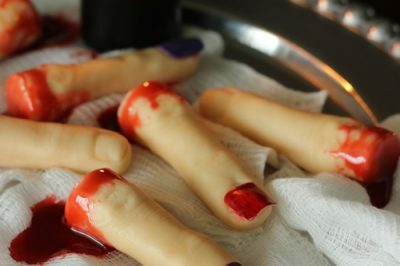 To do this, use your index finger to press the dough between the thumb and index finger of your other hand. This is what the finished crust looks like before baking. Another option is to add cutouts onto the edge. 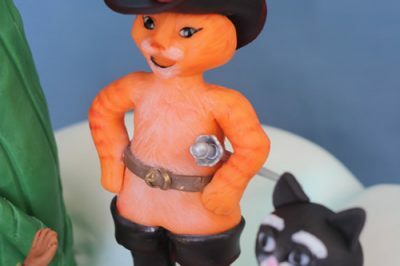 You will need an extra amount of dough to do this. 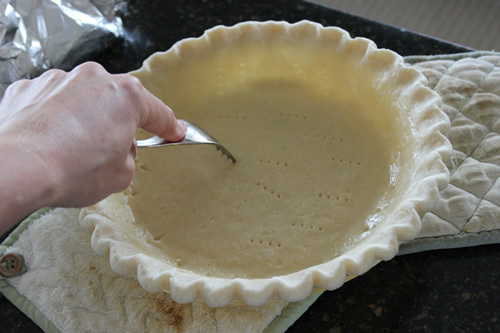 Once the dough is rolled under itself, press the edge down slightly against the rim of the pie plate. 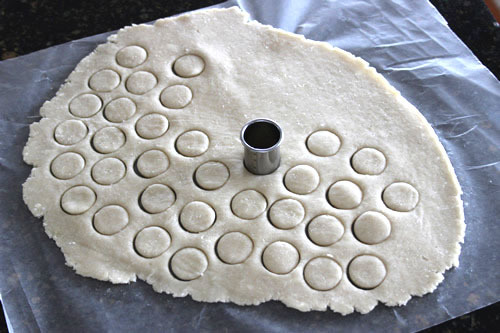 Roll out a thin layer of the extra dough then use a small round cutter , or other small cutter, to cut out shapes. I think I used around 33 circles to cover the edge of my crust. 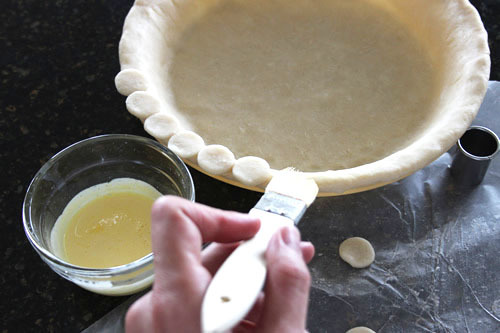 Using either some water or some beaten egg, brush the liquid on the edge of the crust with a pastry brush and attach the cutouts. Here is the finished cutout crust before baking. Now you want to chill the crust again really well before baking so that it rests some more and the fat solidifies again in order to create air pockets in the crust while baking, resulting in flaky crust. 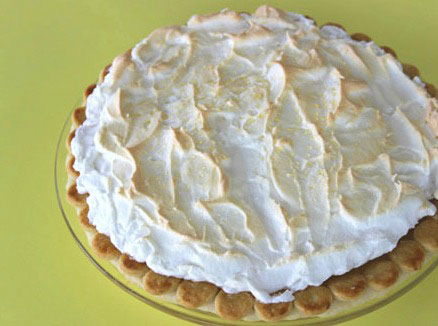 Place the pie plate in the refrigerator or freezer for 30 minutes. I personally prefer to place mine in the freezer. 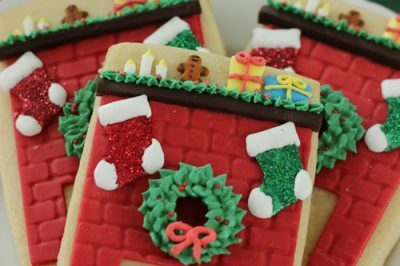 While it is chilling, preheat your oven to 400 degrees. 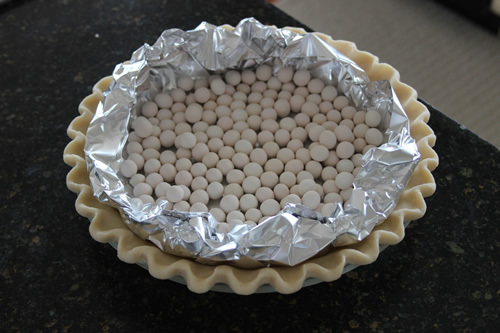 For both complete baking and blind baking, take a piece of foil and lay it inside the chilled crust then fill it with pie weights . Beans also work if you don’t have pie weights. The weights or beans hold the crust’s shape while it sets in the oven. Place into the preheated oven and bake for about 8 minutes, until the crust is dry to the touch. Remove from the oven and lift the foil and the weights out of the plate. Use a fork to prick the bottom and sides of the crust. This helps trapped air to escape from underneath the crust. Place back in the oven and continue to bake, watching closely for air bubbles during the rest of the baking period. If an air bubble does form, immediately use the fork to pop it. If you are blind baking the crust bake for about 8 more minutes, until the crust is almost done but not browned yet. If this is a single crust pie that will not be baked again, bake for about 15 minutes, until golden brown. Remove crust from the oven and place on a cooling rack. 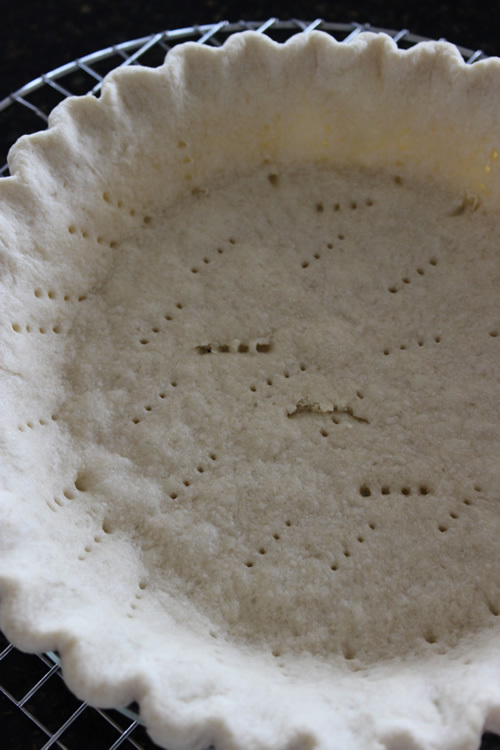 Usually the holes from your fork pricks will have closed up while baking but if you have some holes that did not seal and you can see through them, you will want to seal them up to keep your pie filling from leaking through. This usually happens when you have to pop an air bubble during baking. Below you see some open holes in my partially baked crust. 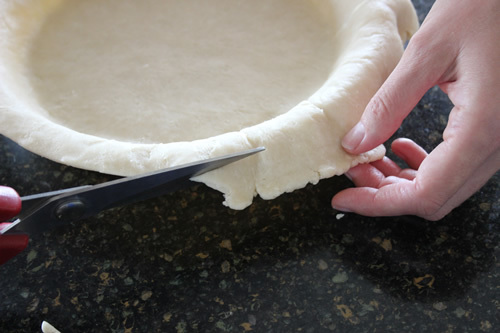 To seal them, pull out the scrap dough that you cut off from the edge of the crust earlier and, while the crust is still hot, use your fingers to press a small amount of the scrap dough over the open hole. It will instantly melt onto the crust and you can carefully smooth it in place. The heat from the crust will continue to cook it and you won’t even know it is there when you go to eat the pie. Here is what the patched up crust looks like. 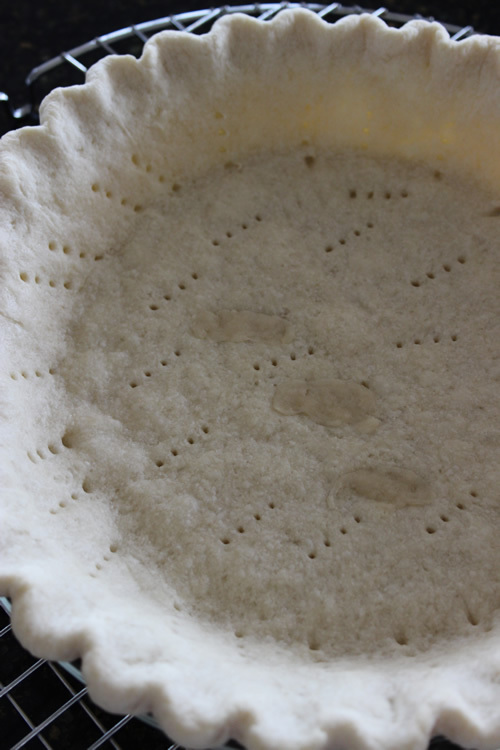 Allow the crust to cool completely before adding any type of filling to it, even if it is going to be a double crust pie. If this is a single crust pie to be filled with a ready-to-eat filling, once it is cooled, you can add your filling and enjoy. That is where I will leave off for today. Next week I will post a tutorial on finishing up a double crust pie by adding the top crust and also a tutorial on making a lattice top crust. I may even try to throw in a trouble shooting guide to help you with some of the most common pie crust dilemmas. Very interesting on how to bake it. Mine always shrinks, so I’m going to try baking it the way you bake it. Thanks for the nice comment Aunt Sandy! That is such a great idea about adding cinnamon and sugar to the leftover crust. I hope this was helpful. My mom never makes pie crust either. She just buys it as well since it is easier. That is probably part of the reason I have been so determined to figure it out. 🙂 I’m still learning though. I hope to finally have it down by the time I’m a grandmother. Ha!